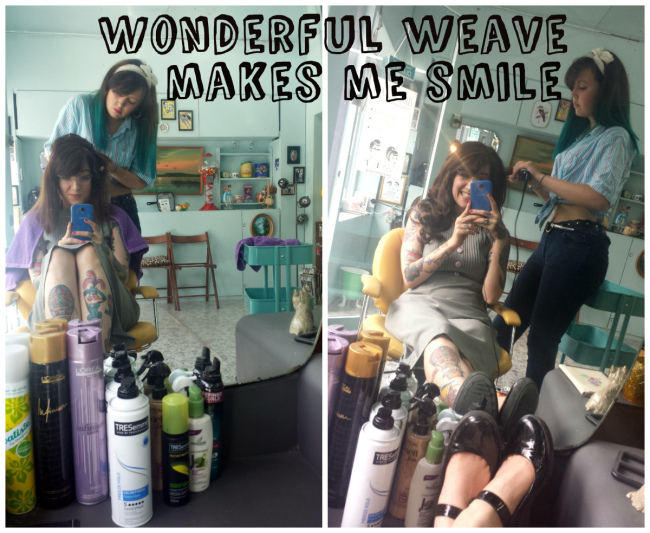 Yesterday, after a cancellation at Rockalily Styles, our new blow dry and styling bar, I decided it was time to get my weave sewn back in! I'd taken it out back when the weather was just crazy hot, and the weave just became a bit gross. But I've definitely missed her (it?). So, what do I mean when I say weave? Some of my own hair is plaited into cornrow braids along my scalp, and wefts of hair are sewn (literally with a needle and thread) onto/into the braids. When we choose to wear extensions, we have to choose which fixing method suits us best. Our hair types are different, and the results we want vary. Whether we go for bonds, clip ins, nano rings, glue, sewn in etc, is a personal choice each and every time, and I don't think that there is one method that is always best for everyone. On the left you can see my real hair, and on the right is my faux hair. The trick is obviously to style your hair to blend the two together. I could make this much easier for myself by having my extensions shorter, so that the difference between the two was lessened, but I enjoy the silliness of the length too much! It's like playing dress up! No matter which fixing method you've gone for, you have to be somewhat conscious of how you wear your hair to disguise the fixtures. In my case, its the tracks (the braids with the weft sewn onto them). I find a half-up/half-down hairstyle works best for me. The downsides to sewing in weave? Itchiness is the main complaint, as the scalp under the braids doesn't get washed very well. People do complain that their hair falls out, but this shouldn't be the case. We lose about 100 hairs each day, and when our hair has been braided, those hairs that would naturally fall away stay in the braid. When you take your braids out, there will be a lot of hair that comes away, but this would have fallen out anyhow, in your hair's natural life cycle. Phew. It can be a bit scary the first time!